Choosing change is risky and hard. It takes courage and hope. There are just times in life when you know something is no longer working. This could look like a behavior, coping mechanism, career, or relationship. Change is meant to bring about motivation and renewed sense of self. I know God uses restlessness in me as motivation to get unstuck in life. Comfortable is safe and predictable, but that does not equal life giving. 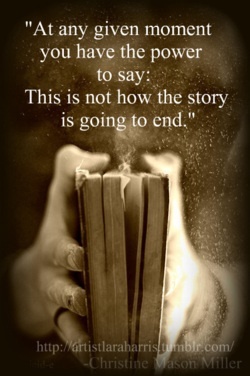 He is always writing a continuous story in us and carrying it on to completion. He redeems all things and makes all things new. There is nothing too lost or too broken for Him. He never settles and never gives up. I am praying you don’t either. Never settle, never give up. You are worth it. You matter and are more valuable then comprehension. What is one way you need to tweak your story? How do you want your story to read? I have lived in many different places. Ambition and drive are always present, but wear different masks. When I lived in DC drive looked like competition of the corporate ladder. Business suites, politics, and salary were the measure of one’s success. Nashville wears the mask of image and fame. The drive looks like the comparison of creativity and talent. The competition of success becomes the filter through which we relate to others and view ourselves. The easy answer is that money makes the bar of success. Maybe having a best seller is success, or a hit song. Success is whatever makes you considered the best in your field of determination. However, the issue with the false advertising of success is that the bar is unmeetable. There will always be someone who we will see has better or beneath us. Success needs redefining. 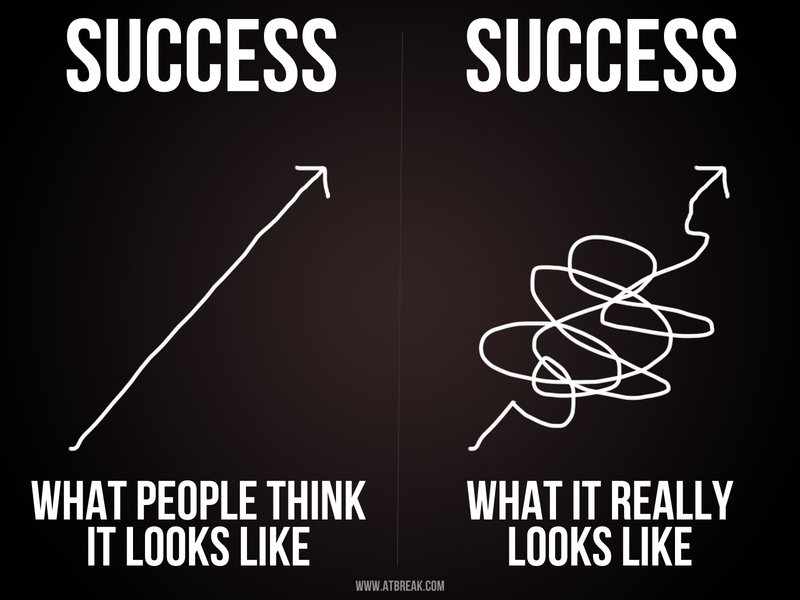 Success needs a new outlook. There is a tension of wanting to do more to be more. Drive and passion are good, but faithfulness and character matter more. Success should be driven by how we treat people – how marriage shows commitment and loyalty. Success should look like celebrating the gifts and talents of others while being great at where you are presently. Success and failure should not be defined by comparison. Small things matter. You gifts and your heart matters. How you are faithful and obedient to those abilities given to you is what success is. Love well. Wait well. Celebrate other people often. Be successful at who you are, not what you do. What is frustrating to you about success? What is your comparison trap? As far back as I can remember I have always fought to do my own thing. I thought I could teach myself how to ride a bike, climb trees, play sports, tie my shoes, and pretty much anything my older brother was doing. There is also a side of me that has learned how to be very self-sufficient as well. When I was a junior in high school, my family experienced a huge change through the confessed affair of my father. That event was a catalyst for this independent girl to shift right into complete self-sufficiency. I also carry around the apple that fell from the tree of strong and stubborn from my mom as well. As everyone in my family was trying to emotionally put life back together, the survival skill of self-sufficiency took deeper roots in me. I have carried around the messages that life has been up to me, and that I am responsible for what happens. There is some level of truth that. However, this does not leave a lot of room for surrender. At some point we all battle with playing the role of being our own kings. We decide that we can do it better than God and manage whatever we are facing; and onto the throne we go. We can look back in the Old Testament and see that for centuries the demands on and for a king have always failed. It is no mystery why I have experienced failure in my life every time I take on the throne. Pain is the only result when stepping outside of what only He can do. Surrender is something that is so hard for me. It goes against every grain of independence. I hate feeling out of control, and choosing to surrender immediately brings on that feeling. My heart constantly feels the tension of playing Tug-Of-War with God. I have spent my whole life as an independent. I don’t know how to make the shift from independence to dependence on God. I know it’s a choice – a choice that takes trust and risk. I am working on choosing to find contentment in feeling out of control. I am definitely tired of experiencing failure. Surrendering is a hard choice to make, but is worth it in the long run. In what ways do you struggle with surrendering? What are you holding on to that you might need to surrender? There are many roads in life. You might be at a crossroads or fork in the road. Maybe you’re walking the road to redemption or truth. You could also just be at the end of your road. Whatever road you are finding yourself o, it matters. Everyone has a road marked out for them. Every road is personally designed and tailor made. This weekend, I watched a great movie called The Way. I loved it. It was about a group of four mismatched people walking an amazing journey along the Camino De Santiago. This journey is made by thousands – all in search of something for their own hearts and lives. The most popular route of the Camino De Santiago starts in southern France and stretches 500 miles into Santiago, Spain. The common hello and good bye was “buen Camino,” which translates to have a good trip, or good road to be exact. Each character had a different purpose for walking the Camino. They all walked this stretch of life together. It was shared heart’s, shared stories, shared pain, shared questions, shared scenery, shared sorrow, and shared joy. The road was challenging. It had set backs as well as abundance. They all had different paces. Each one made it to the end in Santiago. The apostle James is said to be in Santiago. The original purpose for the pilgrimages across this Camino was to seek forgiveness from St. James. Thousands have walked the redemption road. People from all over the world, come to different life revelations. It was so beautiful to watch and imagine all the stories along the Camino. Everyone is on their own road marked out for them. Everyone is on some road of redemption. We meet many along the way – all stories are different and purposes not fully known. 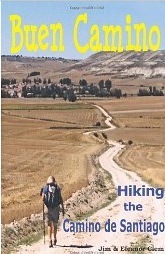 All Camino’s have challenges and questions. I want to encourage you to walk well with those journeying with you. Listen and love deeply. What does YOUR Camino look like? Hope is a seemingly small word, but she packs a big punch. Hope seems fleeting at times, and in certain seasons of life, more often than not. I catch glimpses of hope. At times, I catch glimpses of what I am even hoping for. There are days where those glimpses seem to fill me up with more hope and motivation, and there are days where hope is silent. I experience times when I have hope in a moment, and in that same breath feel like I got the hope knocked right out of me. I am learning that hope is not meant to be seen or understood. For who hopes in what is seen. It is the knowledge that unseen things are happening, and the mystery of the unseen evokes hope. Hope requires faith, and faith hope. Hope is the desire we have that something we want can and will happen. Hope is also the desire that things will turn out for the best even if it does not look anything like we hoped. The blessing of glimpses is also something that causes a tension in my heart. When I get glimpses of unseen things becoming visible, it motivates and gives my hope traction. However, those glimpses do not mean what is hoped for will happen soon. Hope is a choice. Hope is a risk. Hope requires faith in the unseen. Hope is a choice. Some days, hope takes everything I have. Hope is a choice for me to believe that there is a something just for me. Hope is a place I want to sit in. I want to hope and believe in love, kindness, faithfulness, joy, grace, forgiveness, commitment, peace, direction, and life to the full. Hope says not me, but you , Lord. I am hoping to be able to say that more confidently soon. What is risky about hope for you? These not so small words have been bringing me to tears lately. I have been sitting and stare at this truth. I know love at all because He first extended it to me. So often I can pride myself on the self effort of love. I crave loving deeply. I make every effort to do so. What I forget is that it’s not my love that I’m offering. THE only reason we know love at all is because He first loved us. THE only reason we recognize love at all is be He was the first to present honest, right, true, and deep love to us. I am realizing how much further this extends into so many other deep truths. I know grace because HE first had grace on me. I know forgiveness because HE first forgave me. I want to make people feel seen because HE first saw me. I want to make people feel valued because HE first valued me. Love, grace, forgiveness, value, and life come from a someone. They are started with a someone. Any parts of those words that I know is because of his firsts. To know more of the depth of those words is to know Him. I am sitting in the weight of what I know because of Him. I am sitting in the weight of wanting to extend the offer of those because they were first offered to me. I just shake my head at the gift. I smile now at the glimpses of those firsts I see of Him as others offer those words. Whether they realize it or not they accepted something, and someone, that was first offered to them. My love is not my own. It started with a someone first. I am only offering the extension of that same gift given to me. I hope to give that gift deeply more and more every day of my life. There are so many things that surface for me regarding the word “fear.” I wouldn’t consider myself a fearful person. I am not afraid of heights, spiders (maybe a little), snakes, bugs, public speaking, and I don’t think I was born with the embarrassment gene. When it came to the game Truth or Dare, I always chose dare. I love engaging in things in which adrenaline turns my voice into a silent expression of awe. Sky diving, didn’t free fall long enough. Bungee jumping, the taller the drop the better. Great White shark diving, first in the water. But what about those little fears that are harder to identify? What about those things you catch glimpses of that leave you conflicted? As I read this proverb, I started to think through and ask myself the question of what are my fears? I discovered that my fears are wrapped up in the things around me. I can safely say that the root of all my pride filled moments, anger, and conflict, resides a hidden fear in me. I am broken and those broken parts in me are messy. The masks of fear in me look like not knowing or feeling like I am enough. I struggle with feeling like I am not good enough or the fear of not having anything good to offer. I greatly crave wanting to offer something worthwhile and great. I fear accpetance in certain groups of people. I fear feeling foolish or stupid. On this road of mine, I have experienced pain and wounds. Anyone who has experienced pain would love to guard against ever feeling that level of pain again – or any pain for that matter. I am learning to recognize how that fear manifests itself in me. How are you fears doing? Do you know what your fears are?